More info:699Euro per person - price when two travellers on a Double Occupancy Bed and breakfast basis, they carry their luggage on shared cargo trailer. 1,200 Euro - price for a single traveller on a bed and breakfast basis (inc. luggage transportation). 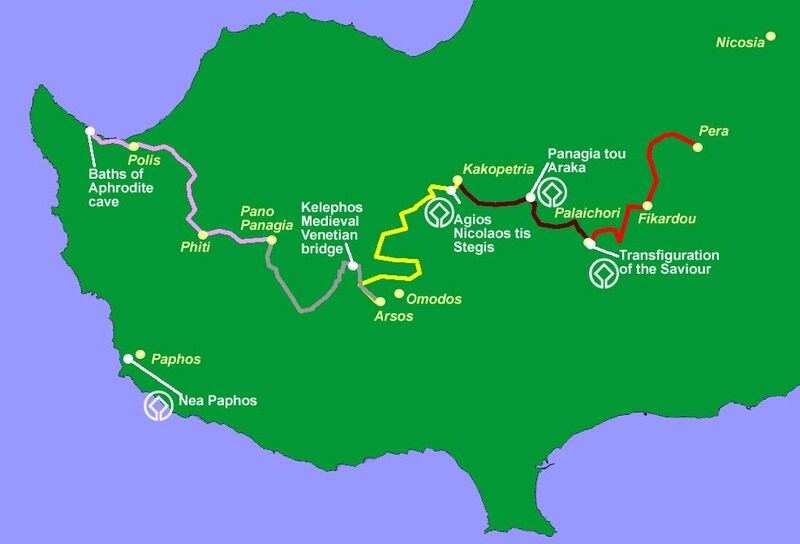 This electric bike cycling holiday in Cyprus is five days of cycling, following a 200km route that takes in much of the island, with a day free at the end of the holiday. Begin your cycling adventure in the pretty village of Pera Orinis, 20km southwest of Nicosia. Then follow a route that uses mostly paved roads through some of the island’s best scenery across the Troodos mountain range to beautiful Akamas, a peninsula in the northwest. It’s an easy route and, if you prefer some longer sections, it’s possible to add on extensions. You can take this cycling holiday throughout the year, although September through to June is recommended to avoid the hottest temperatures. If you prefer to travel in summer, you can still enjoy a wonderful cycling holiday here, with cycling early in the morning and late afternoon an excellent way to avoid the highest temperatures. There are five days of cycling, with a day free at the end of the week. Enjoy some swimming, relaxing, or even hop on a mountain bike and head into the hills. Where possible, we design our travel packages with the intention of enriching our clients experience by taking them through places where it is possible (but never certain) that they will spot very local wildlife. Travellers have the possibility to spot moufflon (a shy, local wild sheep subspecies that resides in Paphos Forest) as well as griffon vultures in Xeros Potamos Valley. We provide instructions on the best and most responsible ways to view any wildlife we encounter. We cherish our rich cultural heritage and make a best effort to use traditional buildings for accommodation, provided they have all necessary infrastructure, permits and insurance. We use such buildings in Pera Orinis, Kakopetria, Arsos and Pano Panagia villages, in other words in four of the six accommodations where the explorers would stay. We value the local architecture that uses locally found materials, and we believe our clients value it too. Besides the fact that using these buildings adds authenticity to our trips, these renovated buildings increase the cultural wealth in our lives and we like to promote them because the use of locally found materials in building construction is as a rule good for the environment in general. In the specific package we do not include dinner even though it would probably be a bit cheaper for the traveller. We prefer to encourage travellers to explore the local communities and benefit a larger number of locals by spreading their spending. This interaction and financial benefit gives an incentive to the wider community to conserve their heritage. When we use taxi's (especially long distance) we make a best effort to use locals instead of professionals living in the cities because we like to support the local, rural economy. Our services are about authentic experiences, and cultural heritage is one large element of these. Local cuisine is a living component of our cultural heritage, reflecting the intermixing of a number of civilisations that came to the island. We encourage visitors to try the local cuisine (including halloumi, the Cyprus cheese), because we consider it of high quality. We encourage travellers to visit at least one rural winery (eg on their way to Pano Panagia village) since the island has a long wine history and indigenous grape varieties not found anywhere else (like Xynisteri, Maratheftiko and Spourtiko). Such visits in turn benefit the wine makers and provide them an incentive to continue to cultivate the ancient vineyards and produce quality wine. We encourage travellers to visit many of the Unesco World Heritage sites on the route (five of the ten Troodos painted churches are either right on or very close to the route), and possibly other attractions on the itinerary, watermills, medieval bridges, picturesque villages and even ancient trees, as it greatly enriches their experience and may also benefit the local communities.